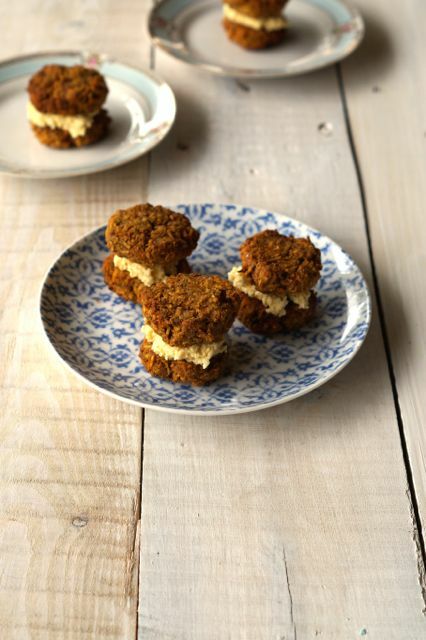 Easy Healthy Carrot and Ginger Cookies. 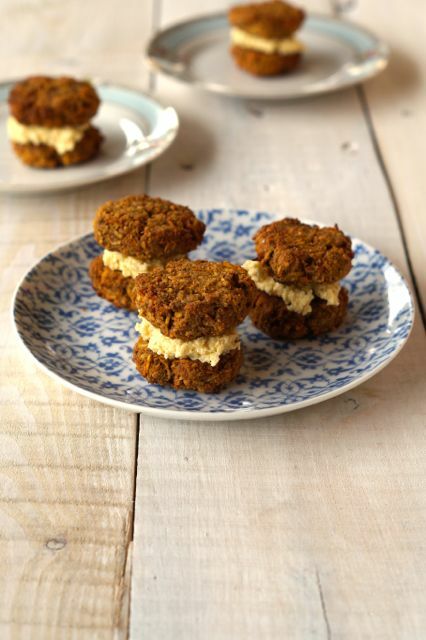 Huge YAY for these easy healthy carrot and ginger cookies! Seriously easy to make and serisiouly delicious! As you know we’re having a break from adding natural sweetener to our healthy real food sweet treats (should we call them ‘unsweet treats’?). It really turns out you don’t even need to add the sweetener! Plus we’re definitely feeling benefits from the lack of sweetener! We made our cookies extra special by making them in to sandwich cookies! We used our Carrot Cake Frosting recipe. So… shall we call them sandwich cookies? Or maybe these are whoopee pies? 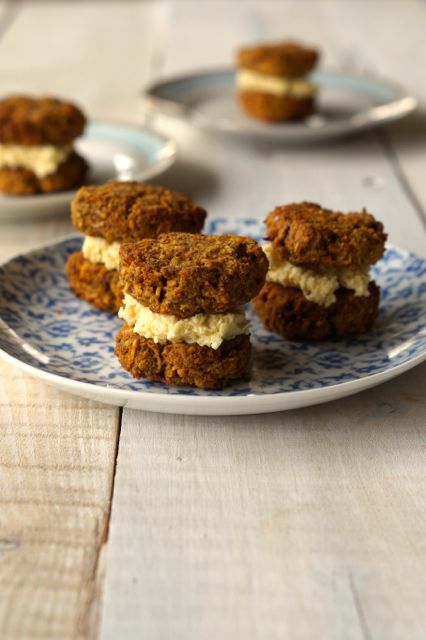 Anyway we mentioned in that carrot cake recipe that everything double decker is better… sooooo… we smell a new obsession! 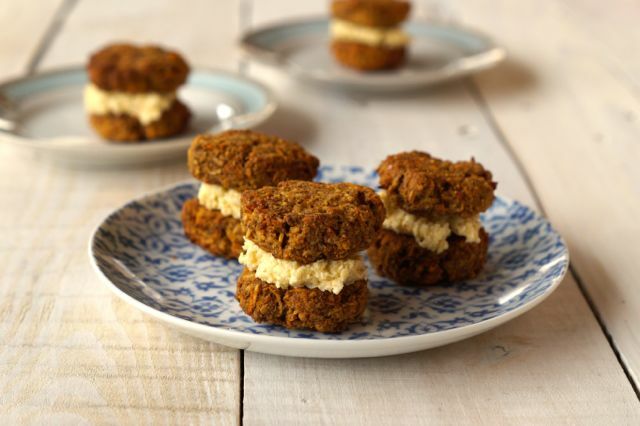 Let us know what you think of these delicious healthy carrot and ginger cookies! We love them! Perfect with a cup of tea before bed. preheat the oven to 180°C (350°F) and prepare a baking tray with baking paper. In a large bowl combine all the ingredients except the butter and egg. Add the butter and egg and mix well, the mix should stick together. Roll and flatten mixture in to desired cookie size, we did small ones and made 16. Place on to the baking tray and bake for 25 minutes. In your blender or food processor whiz the coconut until super fine. Add the butter cubes and continue to whiz, it should be getting smooth. Add the lemon juice, rind as well as the vanilla and continue to whiz. Once the cookies have cooled, spread filling on the top side of one cookie and sandwich the other cookie on top. Continue to do this for the rest of the cookies! YUM! We chose not to add any sweetener. If you like it sweet feel free to add 1 or 2 teaspoons of honey or maple or rice malt syrup to the cookie dough.